Rich has a good point — the design with its need for a minimum of 4 colours is not well-suited for V-carving. Not quite finished, but here’s a re-drawn version which I leave as an exercise for the reader to finish processing in Inkscape, scale appropriately for import, then work out CAM operations. From one 80132 to another. Quick and Dirty, Start with one @WillAdams vector file instead of how I did it. By no means ready to run. Use cloud convert to convert it to DXF. Import into Fusion 360 (attached file) or Carbide Create. Looking at that, I’m kind of mystified as to why the runways project past the shield. EDIT: and as noted below, there was, I simply missed it last night and this morning in @atrueresistance 's post. In my defense, I’m pretty sure that I tried visiting that site from a search last night and it wasn’t coming up. Only spend a half hour in Fusion. 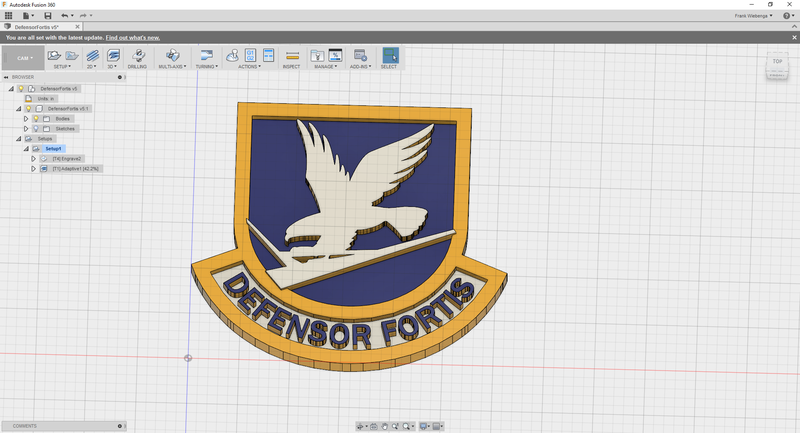 The online dxf converter didn’t do the greatest job. Is the site I referenced for the eps the original copy? I’m not a military man, so just took my best guess. That’s the right place, and a site I simply wasn’t finding last night (hence my re-draw). I’ll look at how it’s put together and see what I can do w/ it. It might be best to start with the black version; I was only able to find a PDF. Using pdf2ps I converted to a postscript which let inkscape see the vector drawing as paths. Opened converted ps in inkscape, selected everything and then Path:Union; this removes the arrow artifacts show in @atrueresistance’s image. Set appropriate tool diameter, depth, etc. Because of the detail, you may have to use a 1/32" bit for some areas (e.g. the talons). The other option would be to not union all the paths (just the arrow and shield) and cut things to different depths. Misliked that one part didn’t get a white outline, and thought it’d work better for engraving inverted. Belike the easiest way to cut this would be to d/l and install F-Engrave, then add the attached font to the F-Engrave fonts folder, then set the desired height. is there an f engrave for mac users? 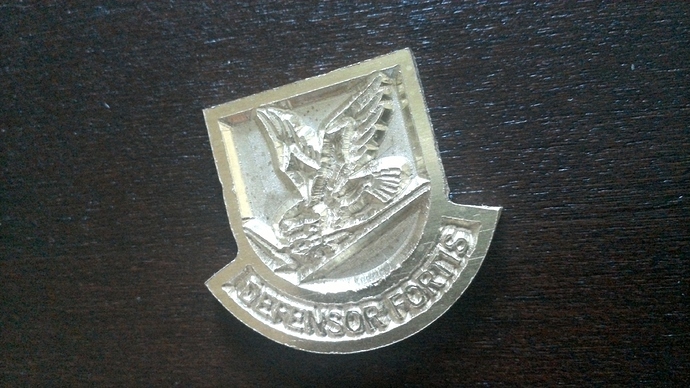 selected the vector .pdf: http://afsf.lackland.af.mil/Shields/DefensorFortis.pdf – the 3D shield versions are likely needlessly complex and the b/w version doesn’t afford all the educational opportunities of the colour one. Note that there are a number of instances of over-lapping elements — these must be addressed so that the image can have toolpaths applied w/o interfering with other elements. When selected, the image is a Group — ungroup until the image is composed of nothing but paths — there should be 42 of them. At this point, the file is usable for V-carving, if there is no need to consider the matter of how wide the V-bit is, and how deep it will cut (the piece would be very small), or if the CAM program used for V-carving has a facility to limit the depth to which it will cut. That is not the case with Carbide Create, so some additional planning, math and geometry are necessary. The first thing to determine is what width a 90 degree V-bit will cut at a depth of 1/8" — this is easily determined using trigonometry, or may be determined by drawing up the relevant geometry, or realized easily when one notes that the projection of a 45 degree angle at a given depth results in one-half of a square, so the width offset is the same as the depth to which we will be cutting, which greatly simplifies the math. At this size, there is no need to depth limit the space around the letters. Would it be possible/ easier to cut the interior around the eagle and runways out completely with a straight bit? Is there a way to stop it from cutting all the way through? Further adjust the paths, or use a tool which limits depths, or use a shallower angle tool, or a thicker material. I figure I’ll just fill w/ powdered enamel and epoxy. Need to get a loupe from work and deburr the edges and then work out some way to infill the colours. Jewellery details from the Nomad? Nomad for gift shop owner? !